If the source cluster becomes unavailable for an extended period, you can configure the destination cluster to serve as the new source. Read and write requests from clients will then be redirected from the old source to the new source cluster. You must be logged in as Infra Admin to perform this task. You need the name of the cluster that is offline. Log in to the DPS UI as Infra Admin. Access the DLM UI by clicking the DPS icon in the upper left of the page and then clicking the Data Lifecycle Manager icon. Identify the set of replication policies for which the offline cluster is the source in a replication relationship. Click Policies in the navigation pane. In the Filter field, type the name of the offline cluster. A list appears that displays the cluster name as a source or a destination cluster. 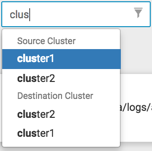 From the list, select the cluster name under Source Cluster. The page content shows only the policies that use the selected cluster as the source for replication. Delete all replication policies that use the offline cluster as the replication source. At the end of each row in the policies list, click the (Actions) icon. Click Delete in the drop-down menu, and then click OK to confirm deletion. If a replication policy is in the process of running a job, the job aborts when you delete the policy. After a replication policy is deleted, it cannot be retrieved. If the Ranger deny policy is enabled, remove the deny policy that is on the destination cluster.